This was a great book. It’s the third by Irish author Tana French, and my favorite so far. I’ve read her earlier books, In the Woods (excellent) and The Likeness (very good, but farfetched), and have been looking forward to this one for quite a while. I’d say it was worth the wait. Faithful Place features Frank Mackey, who was a tangential character in the earlier novels. 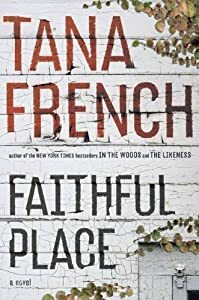 The ‘Faithful Place’ in question is the street (or possibly neighborhood) where Frank grew up with several siblings, an abusive alcoholic father, and an abrasive mother. Frank ran away from his family home as a teenager, and hasn’t returned in over twenty years. The discovery of his old girlfriend’s suitcase in an abandoned house in the neighborhood draws him back in – the night he ran away from Faithful Place, Frank and his girlfriend Rosie were planning to run away together to England. Although he waited for her until dawn, she didn’t show, so Frank ran away on his own, thinking she’d stood him up and taken off on her own. The discovery of her suitcase suggests that she never left Faithful Place, and Frank is drawn into solving that mystery. The action of the book cuts back and forth between the present day, as Frank noses around Faithful Place and visits old friends, seeking answers to Rosie’s disappearance, and twenty years ago, telling the story of how Frank and Rosie fell in love. It’s an excellent mystery, and well worth your time. Plus, Irish accents! This entry was posted in 2011 books, just liz, Tana French by Southern Girl. Bookmark the permalink.